To understand your risk profile? To identify priorities for risk management actions? Ideas for actions to reduce risks? Programs to achieve risk reductions? A process to ensure statutory compliance? Our environmental and general risk management are based on international standards, and developed through projects to achieve statutory compliance with Australian regulations. We offer cost-effective risk identification, analysis, treatment and mitigation options to manage both substantive and perceived hazards. Communication, monitoring, evaluation and continuous improvement inform all stages of our risk management processes. Here’s a visual summary of some highlights from Su’s environmental risk management work. Su worked as the Local Government Liaison Officer for the Queensland Department of Environment from 1994 to 1997. The work focused on the devolution of over 10,000 new environmental licenses to local government. The businesses requiring these new licenses included all motor vehicle workshops, spray painters and panel beaters, concrete batching plants and other operations with mostly local, and many nuisance and non-point-source pollution issues. This was contentious work as new licence fees and compliance systems were a new burden both on local governments and on industry, and the regulatory system was being developed at the same time. Stakeholder frustration affected Su to the extent that she left this position and started a Doctoral thesis that aimed in part to unravel the environmental and other impacts of the Queensland Environmental Protection Act (QEPA). Su developed the Comparative Environmental Risk Assessment Method (CERAM) and undertook two benchmarking studies into the substantive outcomes achieved by the QEPA. The Brisbane Benchmarking Study showed substantive risk reductions had been achieved by devolved activities in Brisbane as a result of the QEPA. The Queensland Benchmarking Study quantified a 41% environmental risk reduction across Queensland, in the first three years of QEPA operation. A 29% environmental risk reduction, from 52% residual environmental risk in 1998 to 23% in 2013. Spill kits issued to all areas with a significant pollution risk. This was mostly the science delivery bays. Large spill kit established in central area and managed by Security. Capacity equal to any realistic spill that could occur on campus. Spill response training program developed and delivered to all Technical Officers. Systems established for first-response, and long-term clean-up of chemical spills. Systems passed their first real life-test when a bus ruptured its diesel tank over a stormwater drain, and very near the creek. Local Environmental Protection Authority satisfied with clean-up. 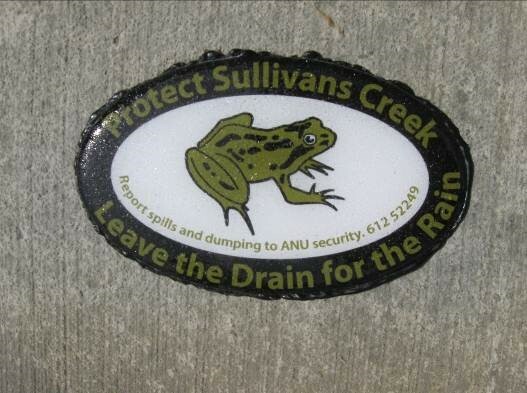 High-risk drains stenciled with “Drains to Sullivan’s Creek” from 2000-2009. High quality drain signage installed on all drains from 2009. Collaboration with plumbers to have suitable separation traps installed in all relevant drains. This included oil-water traps in some industrial areas and sediment traps for cigarette butts in union court. Su developed an environmental risk management training course using the CERAM technique, and delivered this to interested personnel at The ANU, Tasmania and Brisbane during the early 2000s. In 2006, Su was approached by CCH Australia and asked to co-author the Australian Guide to Environmental Risk Management. The book is still available and describes the CERAM method in detail. All of this work focused on the risk posed to the environment by polluting operations. Su has also managed projects to investigate the risk to operations from the environment. An example is Miriam Dunn’s project on ANU Climate Change Resilience Strategies.